Also known as Mountain Ash (due to its leaves having a similar appearance). It is commonly found in the uplands as a solitary tree. The Rowan is an attractive, slender tree with silvery-brown bark, creamy-white spring flowers and clusters of brilliant scarlet autumn berries. The berries are versatile and can be used to make wines, jellies and syrups but they must be cooked first or can induce vomiting. The berries contain lots of vitamin A & C and they can ease diarrhoea and haemorrhoids! Put all the fruit in a large preserving pan and barely cover with water. Bring to the boil, then simmer for 20 minutes or until the fruit is soft. Allow to drip through a jelly bag overnight. Measure the juice and weigh out the correct amount of sugar. Add the juice and sugar to the cleaned preserving pan, and simmer over a low heat for 10 minutes until the sugar has dissolved. Increase the heat and cook at a full rolling boil for 5 minutes, then test for a set. 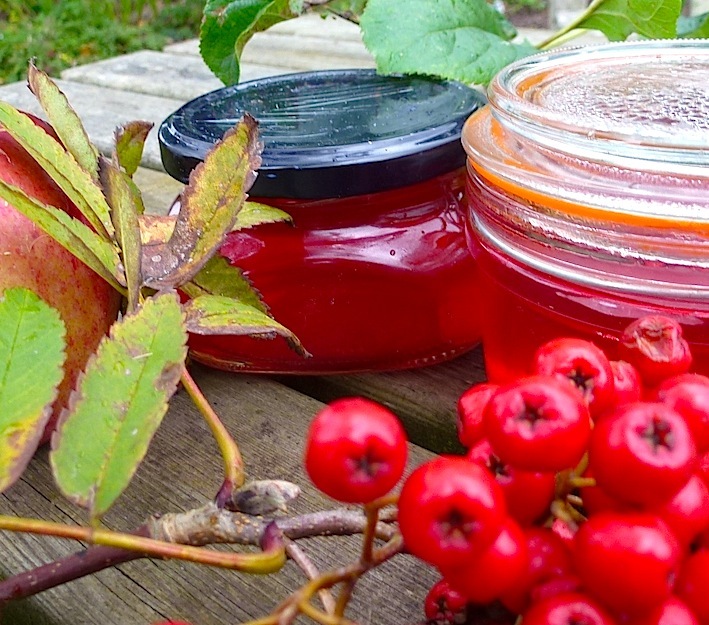 (see tips on jelly making below). When the jelly has reached setting point, pot into hot, sterilized jars, seal and label. Cook apples in boiling water until soft. 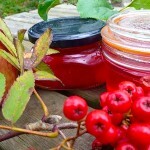 Add the rowan berries and reduce to a mush. then strain through a jelly bag overnight. Measure the juice and add correct amount of sugar. Boil until the liquid has reduced giving a thickened texture. Skim off any scum then bottle in sterile containers. a jelly bag (or piece of muslin) and put the berries back in the pan and add one more litre of water. Repeat then strain. For each litre of juice add 300 g of sugar. Heat and stir until the sugar dissolves. Bring to the boil and boil for 5 minutes. Pour into sterilised bottles, cap and leave to cool. Can be kept in a cool dark place for up to a year. It is said to have connections with the magical world in folklore and a cross made of its wood would protect against witches! Its old celtic name is ‘fid na ndruad’ which means wizards tree. In Ireland it was planted near houses to protect them against spirits, especially of the dead. In Wales rowans were often planted in churchyards. In Scotland there was a strong taboo against cutting down a rowan. The wood was seen as the most protective part and was used for stirring milk (to prevent it curdling), as a pocket charm against rheumatism and made into divining rods. The protective power is thought to come from the bright red berries, as red was thought to be the best colour for fighting evil. © Nature's Work 2018 - site created by Plas Nant Ltd.